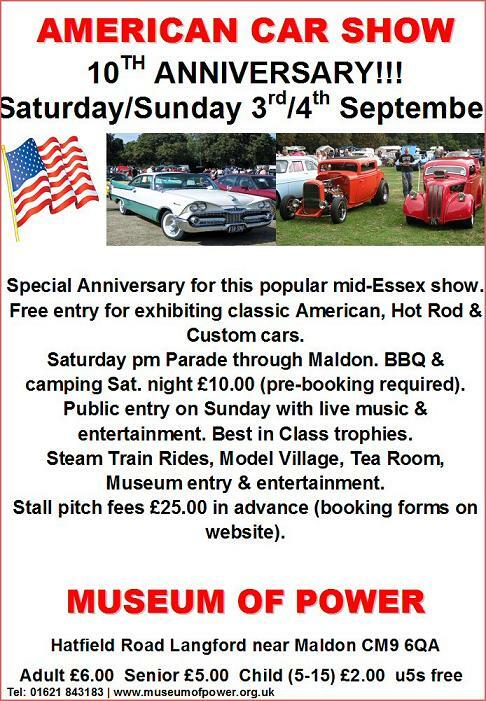 All classic American & Custom cars, & hotrods Cadillac, Buick, Chrysler, Chevrol et, Ford etc The Museum is situated about 1 mile from Maldon, and 3 miles from Hatfield Peverel on A12 London-Ipswich road. American car show at the Museum of Power, Essex. Classic American cars, Hotrods, Custom cars & kit-cars display. Stalls, Autojumble & family entertainment. Museum & tearoom open.